Cinder/Rusted Orange. Zone Pre-Bend Construction Creates Vertical Walls, More Roomy Sleeping Area and Greater Head Room. DAC Press-Fit Poles Main Poles/Velocity Aluminum 7000 Ridge Pole. Jingle-Free Nylon Zipper Pulls. Bought for a lightweight photo trip, but never got used. "Marmot Ajax 3 Tent - 3-Person, 3-Season Dependable and easy to set up, Marmot's Ajax 3 tent minimizes weight by keeping things simple yet highly functional. - Lightweight DAC® aluminum Press-Fit poles have press-in inserts for increased durability - Full-coverage fly - Two doors - Two vestibules - Window Weld waterproof window construction reduces weight and enhances appearance - Catenary Cut floor fully waterproof floor with taped seams lifted off the ground - Jingle-free nylon zipper pulls - Reflective points help you find your tent at night - Multiple pockets - Snag-free zipper flap". Seam Taped, Catenary Cut, Bathtub Style Floor. Floor area. Floor fabric. Style number. Max weight. Min weight. Single Wall Construction with Waterproof/Breathable Fabric. 50d 100% Polyester Trevira 1200mm PU Dry Coating F/R. 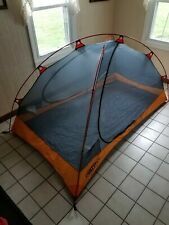 Lightly used Marmot Tungsten 2 person, 3 season tent. Well maintained, great tent. 2lbs 1.2oz (940g). 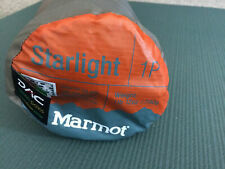 This is the lightest 1 person tent in the Marmot line-up & semi iconic. 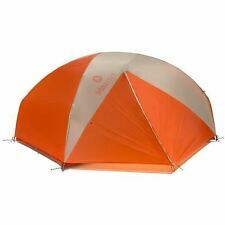 This is one of the most popular tents for thru-hikers needing a combination of durability & feather weight. 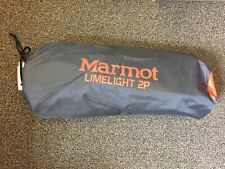 MARMOT 2-person tent LIMELIGHT 2P, in forest green. Barely used, like new. 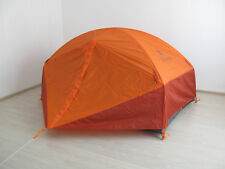 Wonderful tent - spacious, easy to set up, durable. 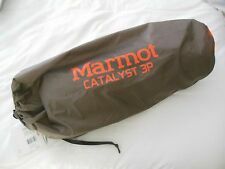 Marmot Bolt 2p Tent Dark Citron OneSize. Pleasant orange ground and foliage color. You will have an easy to setup, lightweight, durable and waterproof tent with a pleasant natural color appropriate for rustic backcountry camping in undeveloped sites where you leave no trace. 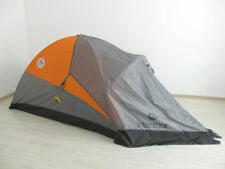 Very roomy and l ightweight dual door 3-season, 2-person tent in a free-standing design. Near v ertical walls, supersized main door, two vestibules, l ight weight, traditional Marmot quality. pre-bend pole construction. Waterproof/breathable fabric, removable vestiule, set up from inside, light weight, traditional Marmot quality. seam taped catenary cut floor. single wall construction. Floor fabric. 40d 100% Nylon 3000mm W/R, F/R. Functional, weatherproof and a breeze to set up, Marmot's Aura 2 tent brings positive vibes to your next backcountry trip. Tent pole material: DAC Featherlite NSL. Stuff sack: Yes. Two doors and two vestibules. The D-shaped door allows no-step entry/exit, and color coded webbing and poles make set-up a snap. Interior pockets for small gear organization; Footprint included. Dac press-fit poles main poles/velocity aluminum 7000 ridge pole.